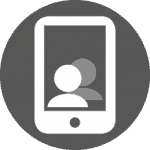 Use a mobile smartphone to capture student attendance data. This is an automated system for attendance recording using a mobile phone app. The phone is either held by the lecturer or fixed to the lecture room entrance. Students tap the mobile phone with their student identity card on arrival. The mobile app records the time, date and location of the transaction, plus the student ID card unique identity number and the mobile phone number. The information captured is forwarded to the central student attendance database via WiFi or mobile data for storage, processing and reporting.